Together with Bhavana Siddharth Mayur und Sunil Purushottam Mayabhate, the founders of mPower are also the owners of Mayur REnergy Solutions, a company established in Pune, India, in 2009 and specialized in energy production and supply. Since 2012, it has had a cooperation with the Fraunhofer Institute for Ceramic Technologies and Systems (IKTS). At that time, Mayur (President and CEO) and Chakradeo (CTO) as well as Suresh Sharma und Mahesh Agashiwala founded h2e Power Systems. Even back then, the four entrepreneurs sought to advance the development and distribution of inexpensive fuel cell units for resource-efficient and reliable energy production, especially in emerging countries. The SOFC systems are equipped with interconnects by Plansee High Performance Materials (HPM). These interconnects, which have been part of the American Bloom Energy Server™ for years, consist of a chromium-iron base alloy mainly composed of chromium (e.g., 95% chromium, 5% iron and traces of yttrium). Such alloys are typically very brittle, since they can only be created from powdered metal by pressing it into shape and bonding it in a sintering furnace. Still, they are suitable for applications at comparably high temperatures of around 850 °C. Plansee turns this material into so-called CFY interconnects, a name derived from its three chemical components (Cr, Fe and Y). 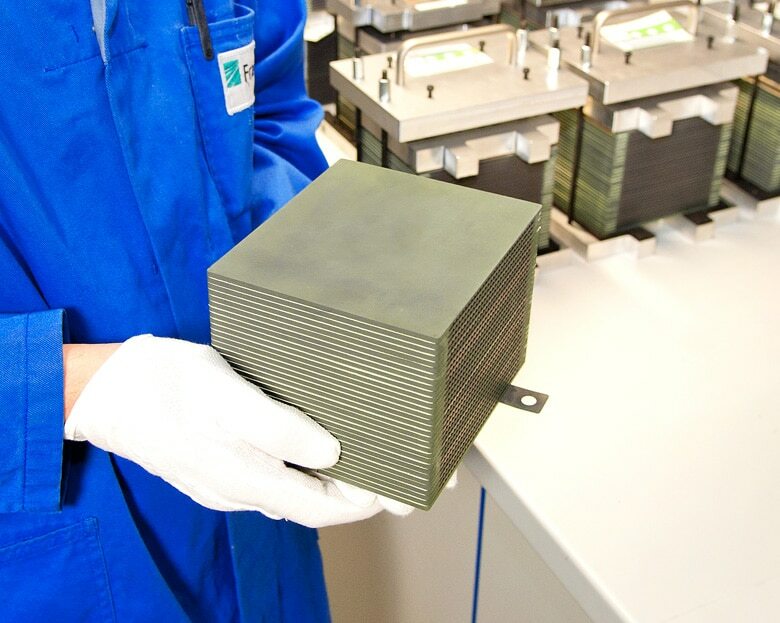 These components create a link between the fuel cell anode and cathode for power and heat transfer and spread the combustion gas and the air across the system – crucial tasks in high-performance cells. Plansee has been active in high-temperature fuel cell development since 1997 and owns a pilot-stage manufacturing line in Austria. The line produces around 500,000 interconnects each year. Additionally, Global Tungsten & Powders (GTP) based in Towanda in the state of Pennsylvania operates two large industrial-scale production lines for CFY interconnects for customer Bloom Energy. GTP is a division of the Plansee Group and is one of the biggest processors of tungsten raw material in the Western world. So far, the finished stacks of type MK351 have come directly from Fraunhofer IKTS. But the deputy director of the institute, Christian Wunderlich, explained during the Hanover trade show that the production demand for stacks had gone into the hundreds, meaning lab manufacturing was no longer a sensible solution. In the mid-term, the aim was to have mPower produce an enhanced version of type MK352 on its own and supply it to external customers such as h2e on the global stage. A manufacturing line for the stacks is said to be set up in Dresden before the end of 2016. The first project stage, during which Fraunhofer IKTS developed two SOFC prototype systems for h2e and set them up in Pune for testing, training and demonstration purposes, had already been completed successfully in September 2015. During the second stage, IKTS delivered three additional, enhanced showcase systems to India and initiated the transfer of technological know-how to allow for the establishment of local device production and commercialization. Besides its above-mentioned activities in the fuel cell market, Fraunhofer IKTS has recently established its Ceragen spin-off, which manufactures the eneramic® system. It has also entered into cooperation agreements with companies such as Vaillant, Sunfire, FuelCell Energy and Convion.